Virtual Assistants are extremely varied in their approaches, roles, and skills. When evaluating Virtual Assistants, one question serves well for navigating the search: Are you looking for a proactive or reactive resource, or somewhere in between? 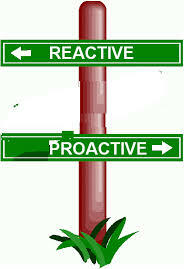 Let’s discuss the different utilities of a proactive and reactive resource. Proactive Virtual Assistants are ideal for those entrepreneurs or managers who are looking to delegate large projects on a whole, and to partner with a VA who can execute and oversee every step of the process, allowing the client to focus elsewhere. An initial hour-long conversation is usually enough for Proactive Virtual Assistants to come in, ascertain your needs, and formulate a thorough plan. Once a task is delegated to a Proactive Virtual Assistant, it is as good as done. Proactive Virtual Assistants might perform market research, deploy online education webinars, manage a comprehensive database, compose original copy, incentivize target audiences to ‘like’ a Facebook page, or manage a variety of other tasks. A Reactive VA is the best option when a client knows what needs to be done, but simply does not have the time (or interest) to execute it personally. A Reactive Virtual Assistant is a task master: delegate a specific task to her, and expect it to be completed ASAP. For example, if you have a social media strategy in place, a Reactive Virtual Assistant would be responsible for scheduling posts and basic level interaction with followers. Similarly, if you provide a list of recommended blog topics, a Reactive Content Writer can work to churn out a 500-word blog post. Or, from an administrative perspective, you might routinely need event planning, calendar scheduling, email management, data entry, client correspondence, or similar admin support. Thankfully, you do not have to choose from a black-and-white pool of either Proactive or Reactive Virtual Assistants. Virtual assistants are adept at mastering the learning curve and running with the task, be it broad-based or specific. As examples, both a Proactive VA and Reactive VA can manage projects, or work as ghost writers. Going with the flow of clients’ needs and personalities, there is always that bit of “yin-yang” in being Proactive and Reactive. Virtual Assistants, like most people, have a tendency to “major” in one and “minor” in another. Your choice among Virtual Assistants simply depends on the level of guidance and oversight you would like to have over the long term. Either way, we always recommend a regularly-scheduled phone or video meeting between clients and Virtual Assistants. No matter how Proactive or Reactive you would like your Virtual Assistant to be, strong communication is the “virtual” key to success in any professional relationship.